All living things have a biological clock that is influenced by the cycle of light and darkness (day and night). In humans, the light enters the retina of the eyes and stimulates nerve impulses, which travels along a pathway to the location in the brain that governs the circadian rhythms (daily rhythms). Many functions such as sleep patterns, body temperature, hormonal secretion (release) and body metabolism change from high to low and back to high again every 24 hours. The biological clock controls the timing of the circadian rhythms. If the circadian rhythm is slow (i.e. longer than 24 hours), you may find that you do not feel sleepy and cannot go to sleep until very late at night and then wake up late morning. This is Delayed Sleep Phase Syndrome, often experienced by young adults and adolescents. If the circadian rhythm is quick (i.e. shorter than 24 hours), you will fall asleep early in the evening and then wake very early in the morning. Many older people report this problem. This is Advanced Sleep Phase Syndrome. Research has found that feeling sleepy and the desire to sleep is enhanced by an increase in the release of a hormone called melatonin, which then leads to a decrease in body temperature. When the circadian rhythm is longer than normal the release of melatonin and the changes in body temperature will not match the usual pattern of sleep at night and awake during the day. For example you may not fall asleep until 2am and find it very difficult to wake up until 9am. The release of melatonin and the drop in body temperature to its lowest level does not happen until much later in the evening. 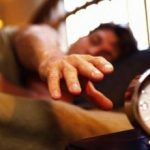 This is why you have trouble getting to sleep until late in the night and usually find it difficult to wake and get up early in the morning. During the day you may also experience tiredness and fatigue. When there is no need to rise early in the morning, such as on weekends you will probably sleep late into the day. This condition is far more common amongst younger people than people aged over 60 years. Generally, people with a delayed circadian rhythm have no trouble maintaining sleep. It is possible to adjust your circadian rhythm to an earlier schedule through exposure to bright light early in the morning. This is Morning Bright Light Therapy. The aim of this therapy is to synchronise the day and night cycle with the melatonin and body temperature cycle. Exposure to light during early morning between 6am and 9am results in melatonin levels quickly dropping (the production of melatonin is very low during daylight), and the body temperature rises. Exposure to light in the early morning will begin to advance your circadian rhythm. That evening the increased release of melatonin and drop in body temperature will begin to occur earlier, making you feel sleepy earlier in the evening.